Born in an Austin backyard in 2014 inspired by vintage and boutique design and heavy riffs. Custom built by musicians for musicians to stand up to heavy touring. Fiercely DIY and seeking to push boundaries by monolithic creations with an emphasis on unconventional builds like 4x15s, 6x12s and 2x18s. 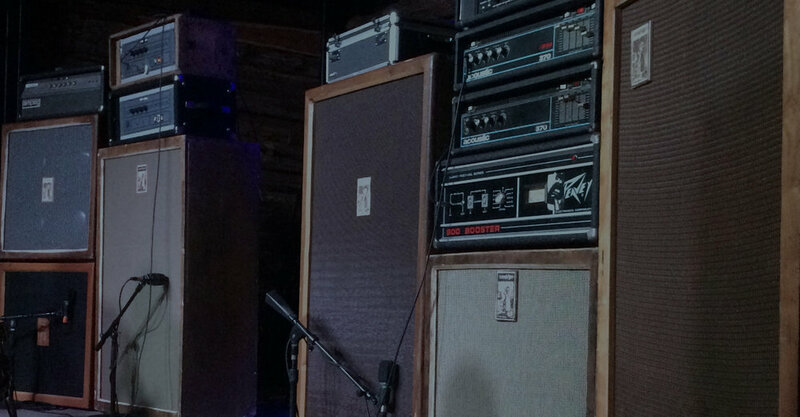 In addition to custom work Worshiper has provided backline support for Southwest Terror Fest, Austin Terror Fest, Northwest Terror Fest, Levitation Austin, Red River Family Fest and bands like High on Fire, Weedeater, Saviours and Acid King. We started building cabs ultimately to satisfy our own personal quest for tone. Cabs that would withstand rigorous touring, high wattage amplification and a customized look to fit our own personal tastes. We use high quality 3/4" voidless Baltic birch and Made in USA speakers such as Weber and Eminence along with hand rubbeed stained finishes and handwired components to ensure solid performance. Email us with your dream rig! We work hard with our customers to provide exactly what they are looking for in their custom piece. We take the passion we have for gear and music and put it into creating a usable work of art for our customers. We specialize in unique creations like 4x15 bass cabs or 6x12 guitar cabs and have built cabs for Primitive Man, Bongzilla, and Beastmaker. When we aren't building cabs, we are musicians playing shows, touring, and providing backline support to local venues and festivals like Southwest Terror Fest in Tucson and Burn the Throne in New Orleans.